CAPS is an orphan auto-inflammatory disease, generally diagnosed in childhood that requires life-long treatment. Canakinumab, a fully human anti-IL-1b antibody, has previously demonstrated rapid, complete and sustained response in CAPS patients. To compare dosing patterns of canakinumab in pediatric and adult CAPS patients of a predominantly Western population (WP) vs Japanese patients (JP). Canakinumab s.c. 150 mg (if >40 kg) or 2 mg/kg (if ≤40 kg) was dosed every 8 weeks. Step-wise up-titrations in dose were allowed in patients who did not achieve/remain in complete response (CR, Figure 1). Median duration of treatment was 414 (29-687) days in WP and 337 days (59-373 days) in JP. In the WP, CR was achieved in 85/109 (78%) canakinumab-naive patients. 127/141 (90%) evaluable patients remained in CR throughout the study. 47/166 patients in WP and 11/19 patients in the Japanese study were pediatrics. 36.2% vs 81.8% (WP vs JP) of children received up-titrated and/or more frequent doses. Higher median doses were required in pediatric patients in the JP compared with WP to control MWS and NOMID (Table 1). 13% vs 45% (WP vs JP) of the children received the maximum permitted dose. None of those children showed an unusual type or frequency of adverse events. 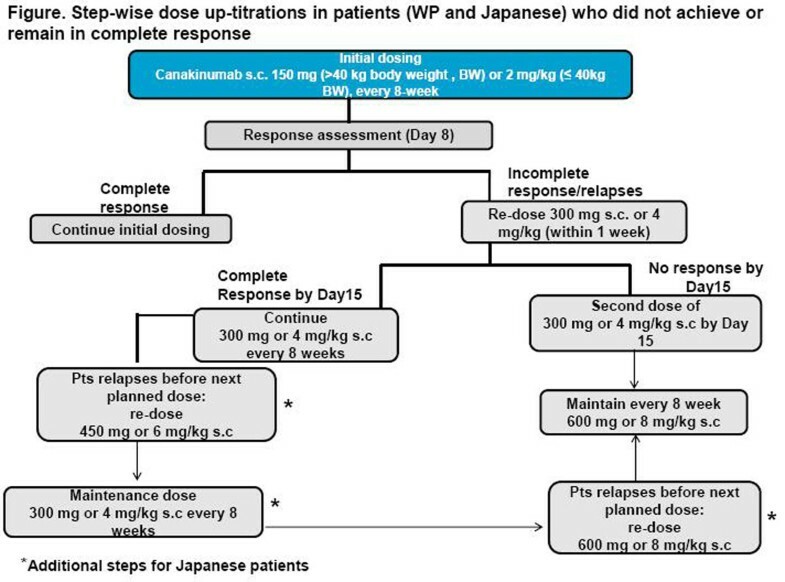 Increased doses of canakinumab were equally efficacious in patients of a WP and Japanese population comprising different CAPS phenotypes without evidence of a change in AE profile. These data suggest that children and patients with more severe CAPS phenotypes, irrespective of ethnicity, require differential dosing.